the food.ie: The great mince pie survey - rules, terms and conditions. The great mince pie survey - rules, terms and conditions. 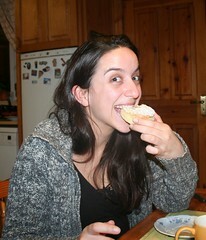 This year however Im going to give my body up for research purposes and do a mince pie survey. Dont let it be said that I do nothing for ye. Value (3) - we are in a recession you know, much and all as I love mince pies Im going to try to be realistic about value here. Filling (3)- Im picky about the filling, it needs to be moist and full of fruit, sweet but not too sweet. Im not keen on suet in my mincepies, even less so after reading that wikipedia link. Pastry (3)- Ill try not to be a complete traditionalist here and test different types of mince pies but its going to have to a good solid tasty pastry either way. Packaging and design (1) - Why is design of mince pie important? Mainly because you dont want your filling falling out. Im a bit of a sucker for a nice box too. If you have a favourite mince pie let me know and Ill endeavour to eat it and review over the coming weeks.